My studio is in the former lunchroom of what used to be a tyre factory. 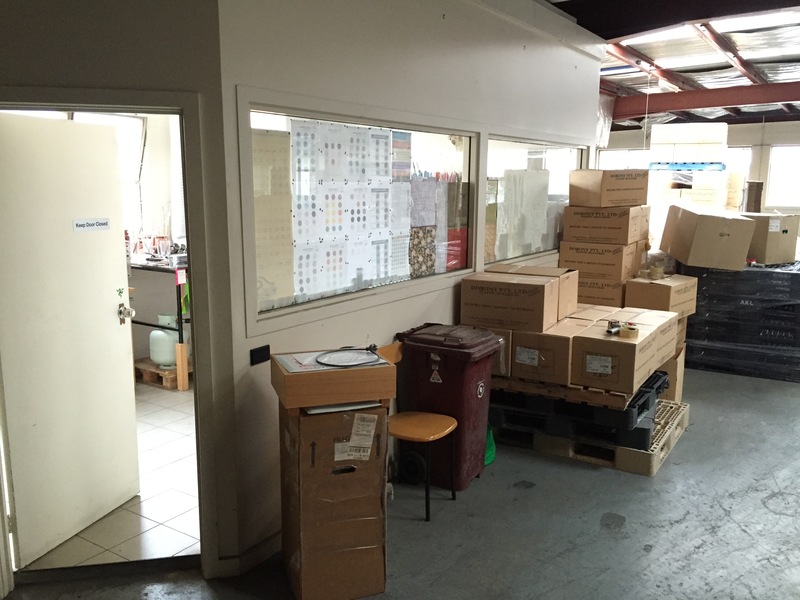 It’s now a warehouse for a plastics manufacturer. I have pallets of boxes and a forklift to keep me company, but there are other bonuses to this space. I have set up two bead making studios. My first one was in a spare room in my home. In my excitement and urgency to get underway I made a lot of mistakes with that one. My second studio is in a factory and it took me a long time to find my perfect space. I had a clear idea of what I needed, after learning from the mistakes with my first set up. A lot of people new to bead making ask very similar questions about how to set up for the first time. There are some great books around that give very helpful advice. I personally found Corina Tettinger’s book; “Passing The Flame” to be the most helpful. Although, being in Australia and so far away from suppliers and manufacturers I had another layer of complication when it came to procuring everything I needed to begin making beads. 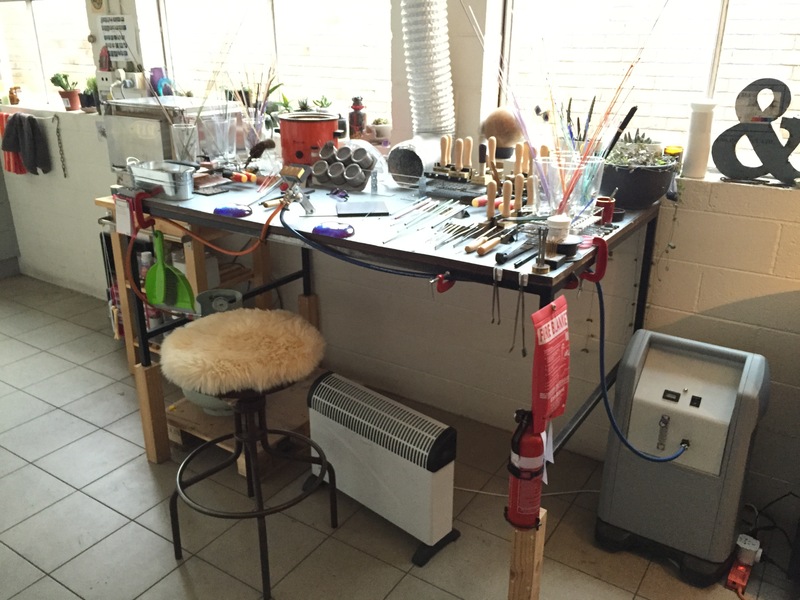 In these blog posts, I try and address studio set up questions, provide answers to common problems and give my perspective on running a hot glass studio. What do you want out of making beads? The first thing you should do (after you have had an introductory lesson and decided that beadmaking is for you) is decide what you want to get out of making beads. By answering this question you will determine what sort of studio you should be setting up. For instance, there is no point setting up a studio with a kiln if you have no intention of ever selling your beads. By understanding what you want to get out of making beads you can determine how much money is likely to be involved up front and what your first purchases will be. You can also project how much you will need to save for future purchases. My studio is a long rectangle, the desk placement was decided by the electrician. He was working out where the best place was to drop the ventilation pipe and it made sense to have it here against the wall. The desk is covered in a sheet of thick aluminium and rests against the concrete wall. I know… I know… everyone wants to buy the torch first. Actually the most important thing is to figure out where the torch will go. When melting glass a lot of fumes are produced and you need adequate ventilation and not to mention space for all the stuff you’re going to accumulate. If you have children, animals or anyone that suffers from asthma living with you, setting up inside of your house is not a great idea. Cats will jump up onto your bench with disastrous consequences (another mistake I made originally was not putting a net up to keep the cat out) and pinging glass can hit sleeping dogs beneath you (put a bed in a spot away from your desk if you have a pet that likes to be your shadow). If inside your house is your only option for a set up you must install an extractor ventilation unit for the health of yourself and everyone else in the residence. Another question to consider when deciding on your studio space is; will it be suitable for a gas bottle and an oxygen bottle? If it’s not going to be suitable, perhaps you will be best off with a torch that doesn’t need oxygen, like a Hot Head torch. It attaches to the front of a gas bottle, which means your torch is portable and you can potentially make beads wherever you want. If you’re looking around at what spaces are available to you and can’t see an option that doesn’t radically require changing (and cost you too much money to do it). You may find that hiring hot glass studio time with another artist is the best solution for right now, until you can afford to deck out a room properly. Are you prepared to drill through walls? Does your home and contents insurance allow you to have gas or oxygen bottles inside or near the external walls of your home? You may need to consider buying an oxygen concentrator instead of using bottled oxygen if you live in a region that requires a permit to have oxygen bottles in residential areas. What if your insurance won’t cover oxygen or gas bottles in or near your home? Will you be happy with a single fuel torch like a hot head and using space outside on a porch? If you don’t want a single fuel torch, do you have space for a studio shed? Can you modify the porch by glassing it in or can you move into the garage? Do you have an old rug (that you don’t mind if it gets burned) or can you get a cheap rug from a discount store to cover your floor? Brick or tiled walls are best. If you don’t have that option you can cover plasterboard up with metal sheet. These are some of the reasons why so many artists work in a shed or garage. The practicality of the situation means that their home is not breached by massive modifications and the freedom to be an artist (and make a mess) is afforded to you by having a space you’re not stressing about keeping clean or burn free. Also consider how you will install proper ventilation into that room. You can’t get away with only an open door or window as a source of ventilation. You do need a door or window open for a supply of fresh air, but you also need an actual extraction unit or ventilation fan as well (I cover this in a blog on ventilation systems). Glass is coloured with metals and oxides. When you melt glass these oxides and metals burn off and disperse into the immediate atmosphere. These particles will settle on any surface (and down your lungs) if not sucked up and dispelled outside and away from your source of fresh air. Over time, the particles will inflict serious health risks to your lungs. Look at your space, get up into the roof if you have to and see where the beams are and how much space is available to you outside of your studio (a potential place to rest a ventilation unit). Then work with a qualified electrician to select a ventilation unit that is suitable. If not, can you attach an extraction hood (like a kitchen canopy or “rangehood”) to your wall above your workstation? Will you be able to place the unit right above or in front of the torch, which is where it needs to be? If you have the luxury of doing up a studio exactly the way you want, choose to put running water and a sink into it. Place some power points nearby so that you can run a Dremel with a flex shaft to clean your beads at the sink. Lastly, a hot glass studio requires electricity. Do you have power to that room and enough power points? I found that I needed a lot more than just one double socket. Do you have a sink nearby or do you want a sink in the room? 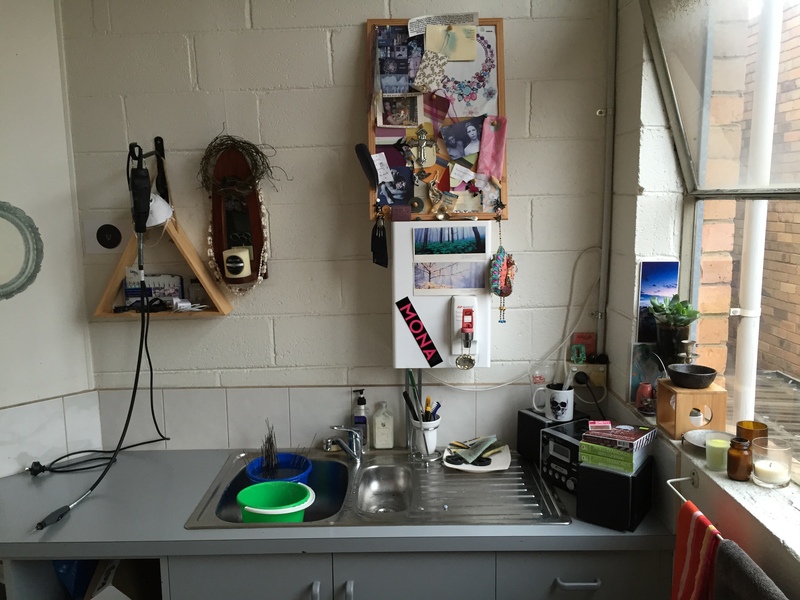 I used to make a mess of my kitchen trying to clean beads, so I went looking for a space that had it’s own kitchenette. Is the room dim or bright, breezy or have no window, extremely cold or always warm? These small things effect your torch placement and what you need to do to prepare the room. In turn these small considerations affects your ventilation placement and your comfort in making beads. If you come from a very hot climate, you will need to assess how hot the room gets just from natural sunlight. A dual fuel torch in a small room will increase the ambient temperature by up to 4 degrees celcius. So be prepared for that. If you live in a very cold climate, certain limitations will need to be considered, for instance, you may not be able to put your extraction fan outside because of freezing temperatures icing up the filters. You may need to build an insulator box and keep the entire extraction unit inside, with a vent leading out through a wall or window. Set up a desk with some adequate ventilation and get torching out in your garage or shed starting with an entry level torch like a hot head. Just make beads! If you become skilled at it or decide this is the thing for you to do on a more permanent basis look around at improving your surroundings. Then set goals and work towards getting a better space, a better torch, a kiln and an oxygen concentrator. Seriously consider the space you want to set up in and go for the quality instalments that you can afford now, then save up for the rest. Set your goals accordingly and reasonably. I’m assuming you already have your torch, but if you’re looking to upgrade that is secondary to a quality extraction unit, then oxygen concentrator/s, then the kiln of your dreams (in that order). Remember, you can batch anneal your beads or send your beads away to be annealed, so a kiln isn’t as necessary as it appears whilst your starting out. If your room needs modifying that takes precedence before anything else, particularly if you cannot get ventilation in. You cannot torch without an extraction fan and you don’t need an oxygen concentrator right away or a kiln. What you do need is ventilation, the right space and then, the right tools. See, I told you buying a torch wasn’t the most important thing to do first! Hi, Sadly I need to sell the contents of my lampwork glass studio. Could you give me any suggestions as to where I might be able to list my many items for sale. Thanks so much for your time.